it seems like such an obvious way to use cabbage, but I’m just hoping that I’m the only one to use it as a bowl. heh. mix all baked portion ingredients on cookie sheet or in casserole dish. Bake at 450* for 30 minutes. stir every 10 minutes. mix all sautéed portion ingredients except cashews. sauté on medium low -medium until tofu is done in the oven. 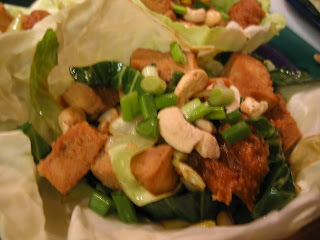 when tofu is done, dump baked mix into sauté mix, add cashews. sauté for a couple more minutes. split up sautéed mix throughout each intact cabbage "bowl", put a dollop of peanut sauce on top, sprinkle on raw corn, green onions and cashews.